Meizu E2 to unveil in April, 26 of 2017. 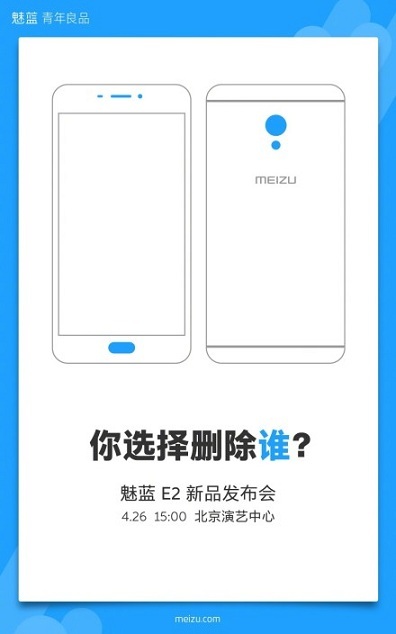 The smartphone in a teaser image from meizu.com look like the previous M-series in terms of design and aesthetics. Previously, a device with Model number M612C was certified at TENAA, if this device points to the E2. That means from the spec listing, the E2 will come with an Octa-Core Processor, 4GB of RAM and 1080p display. If the TENAA listing were to correspond with the model, then other specs, include, a 13MP rear camera setup, metal unibody design and 5.5 inch screen size. The Meizu E2 release is slated for late April 2017, as stated earlier.